click: Host Pawn on an outermost piece of ice protecting a central server. 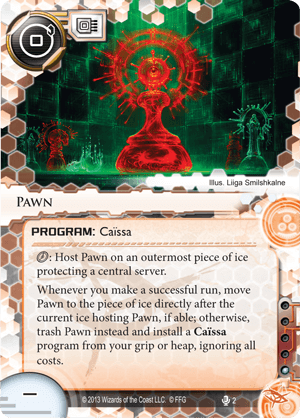 Whenever you make a successful run while Pawn is hosted on a piece of ice, move Pawn to the piece of ice directly after the current ice hosting Pawn, if able; otherwise, trash Pawn instead and install a Caïssa program from your grip or heap, ignoring all costs. According to the FAQ 2.2, Pawn Should read: “Whenever you make a successful run while Pawn is hosted on a piece of ice, move Pawn to the piece of ice directly after the current ice hosting Pawn, if able..."